No one can predict the full outcomes of the next 30 days of the 2018-19 U.S. Government shutdown or the ultimate impact of an off-again-on-again shutdown on the U.S. economy. This uncertainty combined with indecision about Brexit in the United Kingdom, the Yellow Vest movement in France, disappointing growth figures from China and the Tariff Wars imposed by our President has impacted some 800,000 Government Workers, caused massive layoffs in retail trade, disrupted the supply chain of just-in-time delivery programs, broken international trade relations and resulted in confusion in world financial markets. Individuals can potentially spur the U.S. Government into action by forcing members of the U.S. Congress to take action to open the government. One way is under the Hashtag “Fine Government,” which I have proposed that will demand that our congressional delegations in the House and Senate along with the President forfeit all pay for as long as Federal Workers are unpaid and/or being compelled to work without salary. To further initiate action on their part I also proposed that members of the U.S. Congress be fined $20,000 a day for each day the government is defraying payment for Government Employees and that the President, a self-professed billionaire, be fined $100,000 a day. The proposed fines are not assessed because of fault or blame, but because of the failure of Congress and the President to solve the vital governmental function of paying its workers and forcing some to work without pay. If anyone in the U.S. Government is being forced to work without pay, then those in power should share the economic pain that they are inflicting on others. While indecision reigns in Washington, London, Paris and Beijing, what can the average person do to help control his or her own future? I believe that when outcomes are out of your control it is better to plan for a certain result, rather than be carried along by the tide of events. Since no one can know the ultimate outcomes of these world-impacting happenings, it is prudent to assume that the duration of this period of uncertainty will extend for at least another 30 days and initiate something to improve your economic condition and life outcomes. One thing that I advocate in my book, Create Your Own Job Security: Plan to Start Your Own Business at Midlife, is to start businesses when and as needed to raise money and/or accomplish whatever your financial and life objectives are at the moment. Starting something, even if it should turn out to be only marginally beneficial or have an uncertain result, is better than perpetual indecision where no advances are made in any direction while expenses and debts are continuing to mount. Now is the time to think seriously about your business/job/work possibilities, and start ranking them out, something discussed in detail in my book. Some things you will be able to initiate immediately, other actions will take longer because they may require education, a family move or perhaps a permit of some sort. The objective is do what you must at the moment to satisfy immediate needs, but start planning and actions toward starting your own business at an optimum location that can be run in an efficient manner. The foregoing sounds as if I am talking about opening a store. This could be, but for most people this is not the best option in today’s e-commerce driven world. This new business might be something in the arts, this might be selling knowledge, formatting and teaching on-line courses, founding a charity organization to help others, doing service work for those who can no longer perform their daily tasks, getting into politics, inventing something or any of an unlimited number of possibilities. The ultimate objective is to find and develop a business that you enjoy doing so much that you would do it for nothing. Such a business can be done on-line, run from anywhere in the world, have a world-wide audience and produce sufficient income to allow you and your family to prosper. Do what you need to do to survive the moment, but for the next 30 days systematically research what your next self-generated business opportunity might be, and see if some aspect of it might become your “business of passion” that can sustain you and your family for the rest of your life. 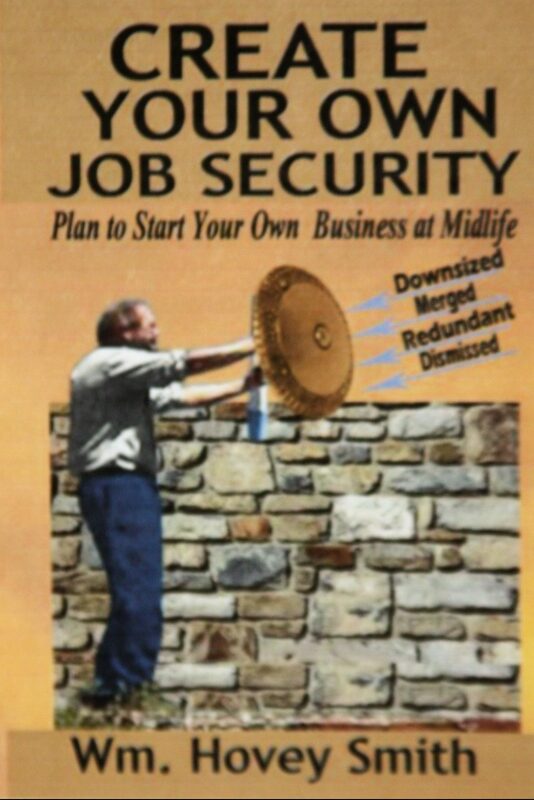 Create Your Own Job Security is available as a softcover and e-book from Amazon and all other book outlets and may be ordered from your local bookstore. I am available for private consulting at a cost of $200 an hour. If you wish to consult with me contact me using the contact form below and describe your problem. If I feel that I can help I will set up a 30-minute telephone conversation and follow up with a written report for $100 that will be based on our recorded conversation. This can be a conference call and any number may participate. Such calls work best if limited to one or two specific topics. Generally available for special promotion price of $10.99. Reblogged this on Backyard deer hunting.